The Annual Canned Food Drive is November 15th from 3:00-5:30PM. This is a collaborative event between WHS students, the Winslow Elks Lodge and the Winslow Rotary Club supports their community outreach. Feel free to leave food at your door if you are unable to be home when we swing by. 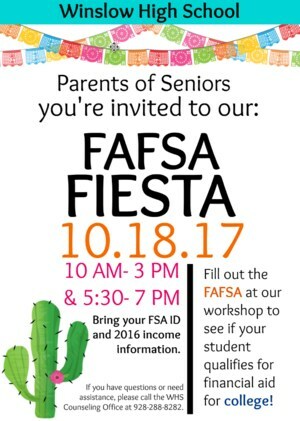 Parents of Seniors, complete your FAFSA with the support of our counseling team! Intersession will run Monday, October 2nd through Friday, October 6th from 8:00-11:00 AM. The final notification for student participation will be communicated to students this week. The bus schedule and route pick up/drop of times are attached. Please take a moment and complete the following survey. Your feedback is greatly appreciated. Parent/Teacher Conferences will be held Thursday, September 14th from 4:00-6:00 PM. The Indian Education will meet tonight at 5:30 PM in the Winslow Junior High School Cafeteria. Hope to see you there! Parents of Juniors and Seniors will learn about ways to pay for thier child's educaiton. Team members will be reading thier favorite books to younger bulldogs. Admission is free. WHS clubs will be holding food sales and other fundraisers. WHS Student Council will host their first blood drive of the school year on Thursday, August 17th in the Gym from 7:30 to 11:30 AM.